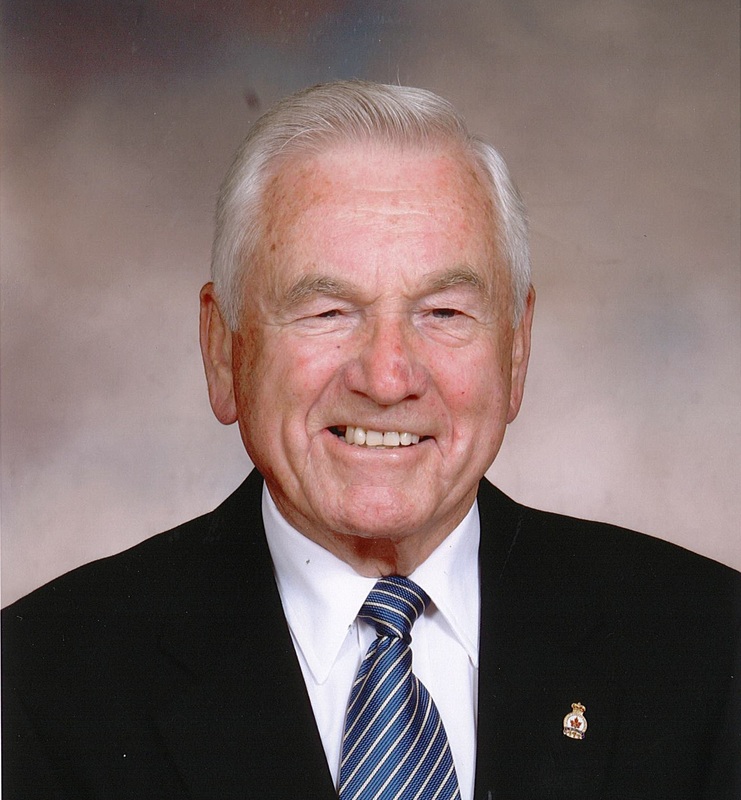 It is with profound sadness that the family of Tom Kelly announce his passing at University Gates in Waterloo on Sunday morning, April 7, 2019 at the age of 94. He died holding the hand of his soulmate and best friend Marjorie “Madge” (Payette) Kelly, and surrounded by his beloved children. His death, like his life, was one of dignity and love. Tom was born in Whitehaven, England, to James Knowles Kelly and Elizabeth Ann (Sanderson) Kelly. He was predeceased by his parents and his older sister, Elizabeth. The family remained close throughout his life. They emigrated to Canada in April of 1929 and settled in Preston where many of the Sanderson family resided. In 1941, at the age of sixteen, he met Madge. 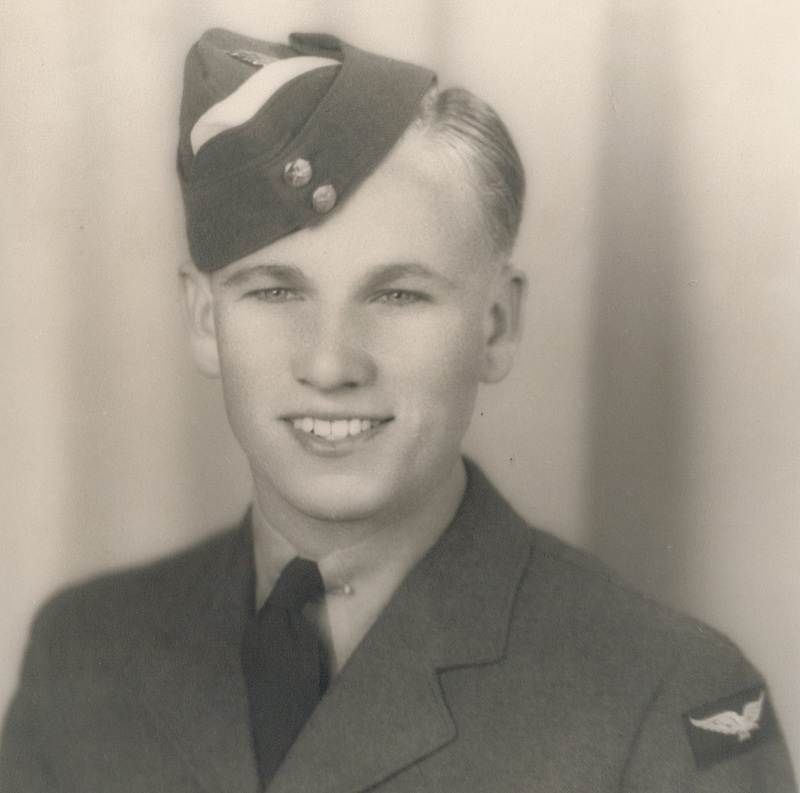 In 1942, at the age of seventeen he joined the Royal Canadian Air Force, and became a wireless air gunner, co-pilot and officer in World War Two. He served with the Royal Air Force with the 77th Squadron Bomber Command in England on Halifax and Lancaster bombers. Dad was very proud to serve his country. Tom and Madge were married shortly after the war on December 7, 1946; this past December, they celebrated their seventy-second wedding anniversary. Their beautiful love story resulted in three children: Catherine (Bob Perry), Christine, and Tim (Barb Wettlaufer), eight grandchildren: Christine Perry (Jamie Golombek ), Rob Perry, Katy Perry (Boro Bulajic), Timothy Hatton ( Carrie Schiel), Laura Hatton (Mattt Enss), Sarah Hatton (Alyn Freeman), Krystal Kelly (Matt Creeden) and Tommy Kelly, as well as six great-grandchildren: Charlie Bulajic, Maggie Bulajic, Keira Hatton, Alex Kroger, Henry Freeman and Rowan Enss. Tom had a long and fulfilling career with Bell Canada from 1946-1984. In 1963, he was transferred from Cambridge to Stratford, where Tom and Madge remained until 2015 when they moved to a retirement home in Waterloo. In addition to family, Tom lived a full life of work, community involvement, and sports. Throughout his life, he was a talented baseball and hockey player, bowler, and golfer. He also cross country skied. He was a Cincinnati Reds fan until the Blue Jays came on the scene, and was a diehard Toronto Maple Leaf’s fan, watching his last game the night before he died. Tom also volunteered actively throughout his life. He coached minor hockey and baseball as well as attending the many sports events of his children and grandchildren. He was a member of Immaculate Conception Parish, Stratford Country Club and Stratford Municipal Golf Course, the Canadian Legion Stratford Branch Number 8, the Royal Canadian Air Force Association and the Telephone Pioneers of America. For many years he taught First Aid. He was a handy man and loved to putter around the house. We all have many home projects that are perfectly executed and look beautiful because of him. After retirement he became an avid gardener and took great pride in his lawn and flowers. Always fit and active, at the age of ninety Tom was found climbing on his roof to remove tree limbs from a storm. There was always music in the house. Dad had a great love for Big Bands and The Great American Songbook, especially Frank Sinatra. He is survived by his wife, Madge, his children and grandchildren, and his dear brother Jim and wife Marie Kelly, who reside in Moncton, New Brunswick, as well as countless cousins, nieces and nephews. Dad was deeply loved. He was a nurturer who felt it was his duty to take care of everyone he cared for. His life was marked by his devotion to Mom and family, his staunch work ethic, his integrity, strong moral compass, and most of all for his kindness, thoughtfulness and calm demeanour. He was a mentor to all of us and a living definition of the expression “gentle man”. He will be deeply missed. We wish to offer our heartfelt thanks to Doctor Mark Sawyer, Christine Bruder, Ruth Amber and the nursing and support staff of the Matthew neighbourhood at University Gates. Your compassion, advice and care for our parents was remarkable and greatly appreciated. Visitation will be at the W. G.Young Funeral Home, 430 Huron Street Stratford on Friday, April 12 from 2-4 p.m. and 6-8 p.m. A service by the Royal Canadian Legion will take place at 5:45 on Friday evening. The Funeral Mass will be held on Saturday, April 13, 11 a.m. at Immaculate Conception Parish, 50 Well St. Stratford, with a reception luncheon to follow in the church basement. Cremation will follow with an interment at a later date. In lieu of flowers, donations to Diabetes Research or the Royal Canadian Legion, would be appreciated. from 2-4 and 6-8 p.m.
Legion Service at 5:45 p.m.
Saturday, April 13th at 11 a.m.